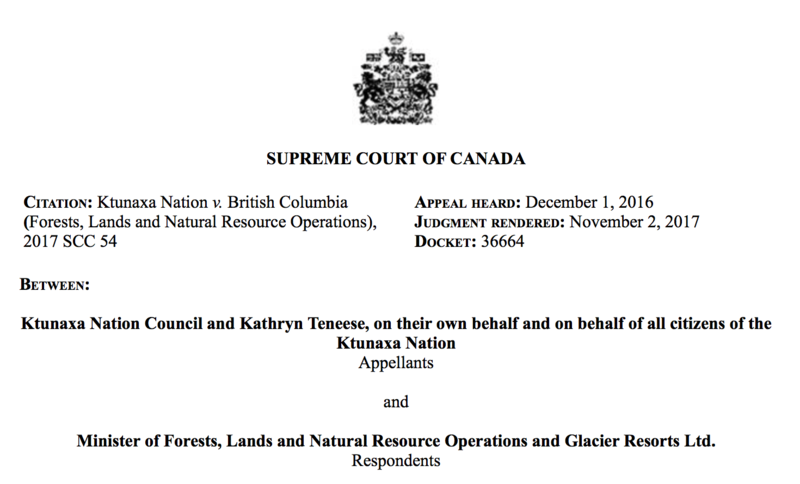 On 2 November 2017, the Supreme Court of Canada (SCC) released their decision in the legal appeal, Ktunaxa Nation v. British Columbia (Forests, Lands and Natural Resource Operations). In this post, I suggest that the court defined the category of “religion” to deny the Ktunaxa Nation’s attempt to (re)claim contested and unceded territory by way of religious freedom. In my reading, the court did so to preserve Canadian sovereignty and jurisdiction over territory, which the Ktunaxa’s claim called into question. In the appeal, the Ktunaxa Nation Council and Kathryn Teneese on behalf of the Ktunaxa Nation object to the building of permanent buildings and overnight accommodation for a ski resort on Qat’muk, a mountain considered sacred. The Ktunaxa claimed firstly, that the building of the ski resort infringes upon the Ktunaxa’s constitutional right to freedom of religion under section 2(a) of the Canadian Charter of Rights and Freedoms; and secondly, that a government minister’s decision to allow the resort to be built breached the Crown’s duty of consultation and accommodation. This failure to hear, listen, fathom or understand, unfortunately for the Ktunaxa Nation, appears to have been borne out by the court’s decision. This failure, however, might also be interpreted as a refusal, particularly when it comes to actually listening rather than fathoming or understanding. Privileging and focusing on belief is… a culturally locatable act because the way in which religion is popularly understood (even by the courts) is identifiably, if only residually, Christian in nature. Legally protecting belief, rather than religion, does not adequately address the depth and complexity of religious experience. Because the majority decision relies upon a definition of religion based upon “beliefs,” the court is able to separate what the Ktunaxa believe from what the court calls the “object of worship,” which is Grizzly Bear Spirit and Qat’muk itself. The majority decision seems to evidence the failure of the court to comprehend or fathom the fundamental interconnections between belief, practice, and place for members of the Ktunaxa Nation. The dissenting opinion, in contrast, contends that the court must address the unique nature of Indigenous religions, in which “the divine” flows from the land itself rather than what is built upon it, such as a church or mosque. As a result, the dissenting opinion does conclude that the building of the ski resort is a substantial infringement of the Ktunaxa’s religious freedom. Regardless, both decisions declare that the minister’s decision to allow the building of the ski resort was justified, given the Crown’s duty to protect “public interest” – a point that I’ll return to below. In stressing that the Ktunaxa are making a freedom of religion claim under section 2(a) and thus “the Ktunaxa stand in the same position as non-Aboriginal litigants,” the court not only brackets out Indigeneity and compares the Ktunaxa’s concerns to a residually-Christian, Euro-Canadian concept of religion, but also constrains the Ktunaxa’s claim through the recognition of “religion.” And it’s not just what is recognized, it’s also what that act of recognition precludes. I interpret the SCC’s recognition of religion as precluding Indigenous nations’ use of the category of religion to (re)claim sovereignty and jurisdiction. The 2009 Qat’muk Declaration asserts the Ktunaxa’s “inherent and preexisting sovereignty over [their] land and [their] lives thereon,” in addition to UNDRIP rights. It is this sort of claim that the court refused to hear or listen to in order to preserve the status quo, Canadian authority over unceded territory classified as Crown or public land. Additionally then, if the Ktunaxa’s claim is made comparable to those made by other sorts of groups recognized by the state, then they are subject to the conditions and limitations placed upon those groups. In Naomi Goldenberg’s work on “religion” as a category of governance and technology of statecraft, one of the limitations applied to groups recognized as “religions” is the ceding of sovereign authority to the state in exchange for limited jurisdictional powers and privileges. Building on this, while religion and associated terms can be “privately-held,” “subjective,” and “spiritually meaningful” (see para. 51, 71), the realm of the “public,” “objective,” and the “political” belongs to the state. Not unlike the separation of Grizzly Bear Spirit out from beliefs and practices, the court’s definition of the Ktunaxa’s claim as “religion” allowed the court (the majority decision especially) to separate the Ktunaxa’s claim out from the land that it was grounded in. The court’s recognition of religion enables a circumscription and containment of the Ktunaxa’s claim in a way that protects the Canadian state’s sovereignty and jurisdiction, which gets clothed in the language of “Crown land” and “public interest” in the conclusions of both the majority and the dissenting decision. To return to the point about “public land” introduced above, in para. 131, the dissenting opinion characterizes the majority approach as being at “risk of excluding Indigenous religious freedom claims involving land from the scope of sec. 2a protection.” In my interpretation, that is exactly what their definition and recognition of religion enables the court to do – to separate matters of belief and practice out from questions about territory and property. In the Ktunaxa case, the categories of religion and property construct a discursive legal framework through which to contain and refuse the Ktunaxa Nation’s claim to unceded territory. The court, in spite of being cognizant of and thus understanding the implications of their ruling, can refuse to listen to Indigenous claims. Rather than the impossibility of Indigenous religious freedom, it may be the impossibility of Indigenous sovereignty when the state claims territory in the name of the Crown and the Canadian public. [i] I offer my interpretation of the SCC decision from the perspective of a settler scholar interested in deconstructing “religion” in Canadian law and governance, particularly in light of critiques from Indigenous, settler colonial, and religious studies. Stacie Swain is a PhD student in Political Science at the University of Victoria, specializing in Canadian Politics and Indigenous Nationhood. She is interested in how discourses on religion and spirituality structure and mediate Indigenous-Canadian relations in political, legal, and legislative contexts. This entry was posted in Politics and Religion, Religion and Society, Religion in the News, Stacie Swain, Theory in the Real World, Uncategorized and tagged Bulletin for the Study of Religion, Canada, indigenous religions, Indigenous spirituality, Indigenous Studies, Ktunaxa Nation, Naomi Goldenberg, Nicholas Shrubsole, politics, politics of recognition, Religion, religion and law, religious studies, scholarship, settler colonial studies, settler colonialism, Stacie Swain, Supreme Court of Canada, UNDRIP. Bookmark the permalink.